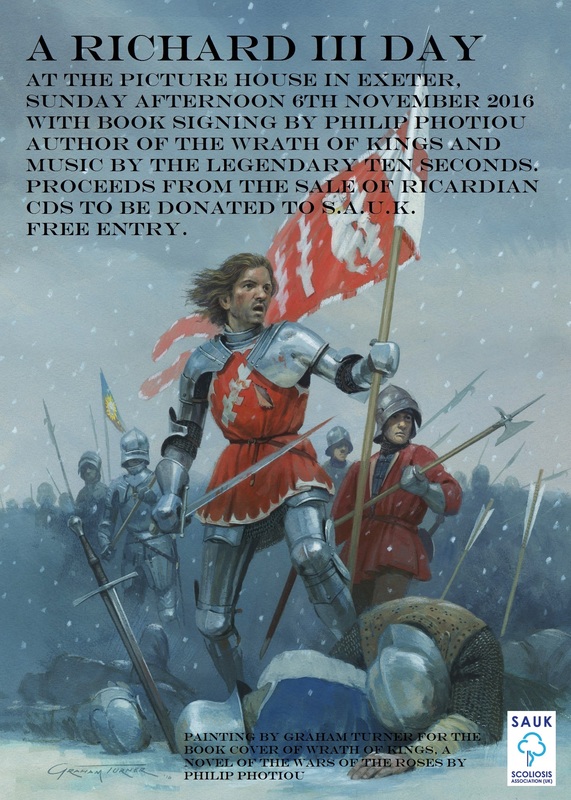 Children learn the gory truth about the Battle of Bosworth and Richard’s demise…. I do not like including images of Richard’s remains, but the above double-image is from this article, in which Professor Sarah Hainsworth, who has given a talk to 10-11 year olds from Turves Green School. “….World renowned forensic scientist and engineer, Professor Hainsworth, Pro-Vice-Chancellor and Executive Dean of the School of Engineering and Applied Science at Aston University shared her expertise with 80 Yr10 and Yr11 students from Turves Green Girls’ School on 23rd October. The students were apparently shocked by the bloody details of his terrible death, but let’s hope that the talk inspires them to not only want to know more about our history, but about Richard in particular. Too little history is taught in our schools these days, and the next generation is in danger of losing touch with its roots. It’s a rot that should be stopped! NOW! Click here to read more: Here. This was interesting, but even more intriguing was the way it was treated. Scoliosis is usually treated by inserting metal rods each side of the spine. The operation is very invasive, involves large scars and leaves the patient with a spine which is very stiff, although straighter than it was. The old way would have meant Julia would never dance again, which is why Simon Cowell stepped in when he heard that the new technique would allow the spine to still be flexible enough to dance. Just imagine if Richard had had access to this kind of treatment! Seven years ago, before this blog officially began, a letter was published in the Ricardian Bulletin about the common Edward III descent of the Duke and Duchess, as she soon became, of Cambridge through the Gascoigne-Fairfax line. This, about the Duke and Duchess of Sussex’s mutual ancestry, followed this March. 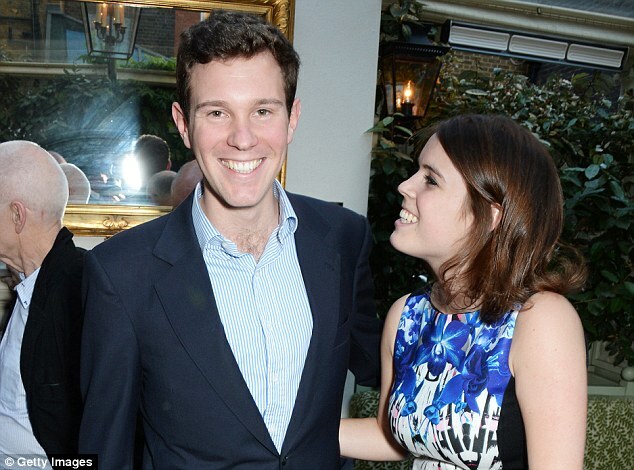 Now it is clear that Princess Eugenie, the former scoliosis sufferer and daughter of the Duke of York, and her partner Jack Brooksbank are closely related through Edward III and James II (the Scottish one). They will marry at St. George’s Chapel, Windsor on 12 October. Having examined the evidence, this document and shows that they have a most recent common ancestor: Thomas Coke, 2nd Earl of Leicester (1822-1909). Coke’s simplest royal descent is from Charles II. Brooksbank is descended from Edward III via Robert Devereux (2nd Earl of Essex, through four of Edward III’s sons, although I have chosen the senior Mortimer line) to Coke’s second wife, Lady Georgiana Cavendish, although there is probably other Edward III ancestry. Lady Georgiana’s grandmother was Lady Catherine Gordon, daughter of the Marquess of Huntly and this line descends from James IV, who is obviously more recent than his grandfather, but through his mistress not his “Tudor” wife. He, of course, was James II’s grandson. This document shows that Lady Georgiana was descended from the first Earl of Harewood, Edward Lascelles, whose wife was descended through the Bowes and Lumley lines from Edward IV. Furthermore, as this picture shows, Princess Eugenie wore a backless dress to show her scoliosis scar. A brave modern-day victim of scoliosis writes a book that sympathises with Richard…. I wish Kathryn Martin all good fortune with this brave book, which is filled with her sympathy for Richard, who did not have the advantage of modern medicine and treatment to help him. 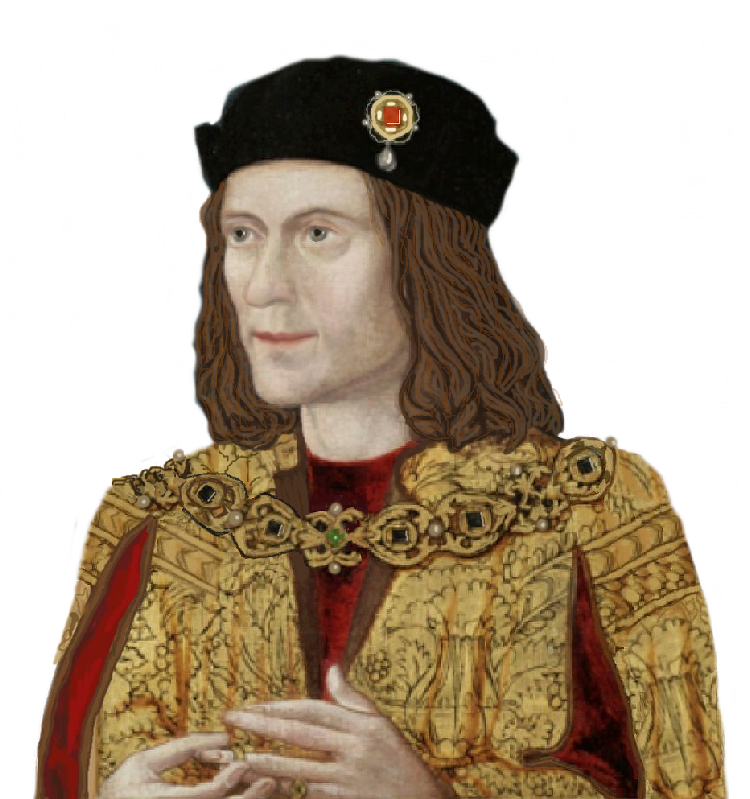 An article about the Bard’s Richard III that actually acknowledges the REAL Richard…. This article is very interesting, because it re-examines Shakespeare’s perverted version of Richard III. Yes, it’s about the play, and a production of it, but toward the end it deals with the REAL Richard, and how he has been damned by the Tudors and their propaganda. Well worth a read. In a previous post, we explored the theory that Shakespeare’s Richard III was actually based on the Elizabethan politician, Robert Cecil. Here is another discussion of the subject, Richard III and Robert Cecil, with references to the hypothesis that Shakespeare was actually the 17th Earl of Oxford, a descendant of the previous Earls of Oxford who were such thorns in the side of the Yorkist kings and one of whom was a major factor in Richard’s defeat at Bosworth. If this is true, it is no wonder that ‘Shakespeare’ was happy to blacken Richard’s name. There are a few misconceptions in the linked article, notably the assertion that Richard executed the 12th Earl and his oldest son; since Richard was only nine years of age on the date Oxford was executed (26th February 1462) this is obviously erroneous and it was, in fact, John Tiptoft who would have presided over Oxford’s execution, being Constable of England at that time (a position he occupied until 1469). Such distortions of age and timing also occur in Shakespeare, of course, placing Richard at the first battle of St Alban’s, when he would only have been two and a half years old! In fact, he took part in neither of the St Alban’ s battles. Also, the article states that the most recent attempt to refute the Shakespearean portrayal of Richard’s character was Josephine Tey’s ‘Daughter of Time’. Although this is probably the most famous such work there have, in fact, been countless more recent ones attempting the same thing, such as ‘The Sunne in Splendour’ by Sharon K Penman, ‘We Speak No Treason’ by Rosemary Hawley Jarman, ‘I, Richard Plantagenet’ by J P Reedman and my own ‘Richard Liveth Yet’. Today in 1564, Christopher Marlowe (right) was baptised in Canterbury. Edward II (left), traditionally dated a year before his own 1593 death. In it, he fuels the myth of Edward meeting his end by a red-hot poker. This is cited by Starkey in his (Channel Four series) Monarchy, who called Edward’s rear his “fundament”, showing again why he should not roam from his “Tudor” area of expertise. obvious. In quoting earlier “historians”, Shakespeare transferred the kyphosis of another contemporary figure to Richard, which some naive people still believe, whilst Richard’s disinterment demonstrated him to suffer from scoliosis instead. Indeed, the Starkey acolyte Dan Jones seems untroubled by the facts in either case. As always, it was a pleasure to sing with Ian Churchward, founding member of The Legendary Ten Seconds at the Picturehouse in Exeter – a wonderful, arty location that always provides a warm welcome. We were joined by lovely staff from the Somerset & South West Scoliosis Association UK who brought balloons, cakes, sweets and donation pots. 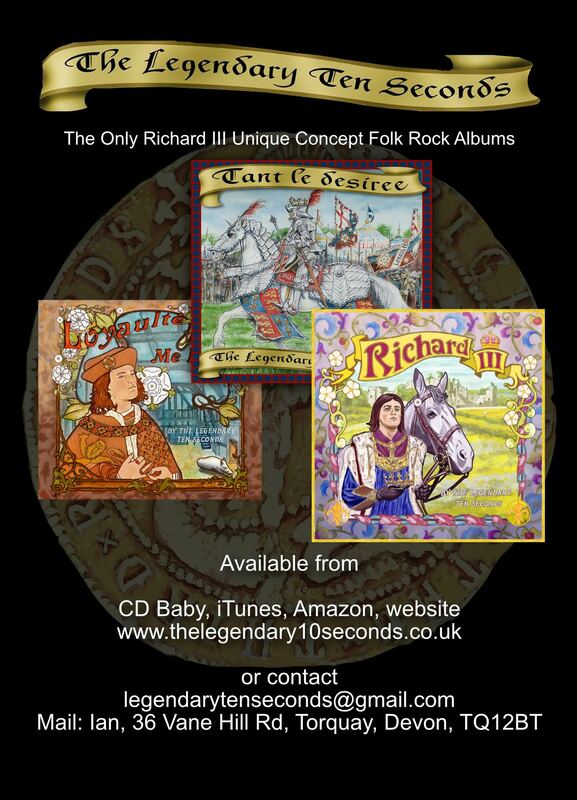 It was great to help raise awareness of the charity and perform Ian’s well written songs about Richard III. An author called Philip Photiou also brought along copies of his Wars of the Roses novel to sell at the event. Rob Stroud on electric guitar and Lord Zarquon on keyboards created a powerful landscape to accompany the historical narratives. Their solos were magnificent. We had a nice sized audience including the artist Georgie Harman who is contributing to the new artwork for the forthcoming Sunnes and Roses album by The Legendary Ten Seconds. Ian introduced his songs with a background of the history and how he came to write it, giving a nice context to each piece. A particular highlight was singing The Year of Three Kings with its catchy sing-along chorus. We sang it for a second time as part of an encore with a much more positive and audible response from the audience second time around, proving how catchy the songs are. Ian chose songs from the first, second and third albums to sing at Sunday’s event, calling me up onstage accordingly. My vocals are on the 2nd and 3rd albums and I have sung most of the songs from the 1st album live, but did not know Ian at the time to record on the 1st album. After a break from the band to focus on my acting ventures I was delighted to re-join this group of talented musicians for a gig at the Picturehouse, where it all began. Ian and I used to sing around 5 songs as part of a music evening consisting of different musicians. It was fantastic to perform a longer set this time with the whole band. While searching for the actor Ben Miller’s association with scoliosis (he had a corrective operation when a child) I came upon the following article, which (I think) he has written. If not, there is another Ben Miller. The item was written in December 2014, but is full of interest concerning Richard’s portraits, tree-ring dating, the fact that portraits of Richard and Edward IV are from the same tree, and so on. Well worth a read. Having been interested in Richard III for a number of years it took me a long time to decide to become a member of the R III Society and it was my very first attendance of a “General Membership Meeting”. Living in the States is wonderful and exciting, but it also means everything is a bit farther away and there is nothing historically connected to Richard the 3rd, the Wars of the Roses or places with a medieval feel. However, if you put together an enthusiastic group of true Ricardians you will end up learning and experiencing about a long ago time that can be as fascinating and different from ours as you can imagine. There were talks about armour as demonstrated and explained by Dominic Smee, who is affected by scoliosis as Richard was, but proved through his training that it doesn’t diminish much what could be accomplished on the battlefield of medieval England. He brought along some of his armour pieces and padded garment. We were also treated to an interesting account of what a re-enactment group like the “Les Routier De Rouen” is all about and how much interest, pride and fun they have during those re-enactment weekends. The insight was given by Christina Smee – Dominic’s mother, who has been a member for many years. We were also treated to a copy of the “Jewel of Middleham” by its owner Susan Troxell – a most beautiful and artful piece of jewellery. Sally Keil gave an interesting look into “Heraldry, Blazonry and (not Coat of) Arms”. It is a pretty complex, yet intriguing subject. Saturday evening was very special all around as many of the attending members dressed up for Cocktail hour in a variety of beautiful medieval garb some of which were pretty elaborate. After dinner we were treated to the evening’s highlight – the performance of the Legendary Ten Seconds. The group is headed by Ian Churchward who also composed most of the songs. He was accompanied by his lovely wife Elaine who sang harmony and some solos. His excellent lead guitar player Robert Bright supported Ian’s rhythm guitar with a flawless performance and a special “sound effect”. Jackie Hudson also sang harmony and accompanied some songs with a harp. When they took the stage they started off with a short intro and then a song called “Written at Rising”, a song based on an actual letter written by Richard III. This song was followed by a most beautiful and melodious “Ambion Hill” – about an unexpected appearance of a knight. One of the intriguing things about the music of “The Legendary Ten Seconds” is that it is so diverse – in speed, rhythm, in what the songs portray and reflect as well as the sound and instrumentation. Not having the full back up and support available so far from their home base it was truly excellent what they were able to convey. The next songs were “Fellowship of the White Boar” – a song about the R III Society’s history and goals, “The King In The Car Park” – I always thought the title a bit strange, but it’s a fantastic song that moves rapidly and tells the story put into excellent lyrics by Elaine Churchward: King Richard of England, he of the White Boar. This one was followed by “How Do you Rebury A King” – not only a good question, but an outstanding song that talks about the thousands attending and watching and it also highlights the significance of the soil from 3 places connected to Richard that was put into his tomb. Ian filled the time between songs with introducing his fellow performers as well as telling us a bit about the songs he has created. The tale of a “Yorkist Archer” was followed by an instrumental about the “Ragged Staff” of Lord Warwick. Then we were treated to a song about Edward’s French campaign in 1475 and the disappointment Richard must have gone through. After that came the lively “The Year Of Three Kings” – a perfect song to sway to and sing along – something we all seemed to enjoy doing. The next song was about the beauty of King Richard’s court and it’s indeed a beautiful song. Sooner or later one is confronted with Shakespeare’s treatment of Richard III. Ian does so in 2 songs – one about the way he turns Tudor’s rewritten history into a play that so many people over the centuries unfortunately have taken as history and not as entertainment. ”Act III, Scene IV” is actually a song straight from the bard’s mouth put into a very smart song of that play. The harmonies are really beautiful and so is the instrumentation. There was a rather sad song about Richard’s role as Lord Protector and all the intrigues that arose. The evening ended with one of Ian’s best songs called “White Surrey”. While he acknowledges that this is legend and we really have no way of knowing what kind of horse took him into his last battle, it is a fabulous song about Richard’s last charge. It is exciting as the listener is taken along the unfolding courageous charge. It was a wonderful and enjoyable evening. The audience showed their appreciation for a great performance with a well-deserved standing ovation. Personally, I wouldn’t have wanted to miss this evening, it was such a treat to hear them. Thank you to all who made this possible and Thank you for coming to Denver, Colorado.